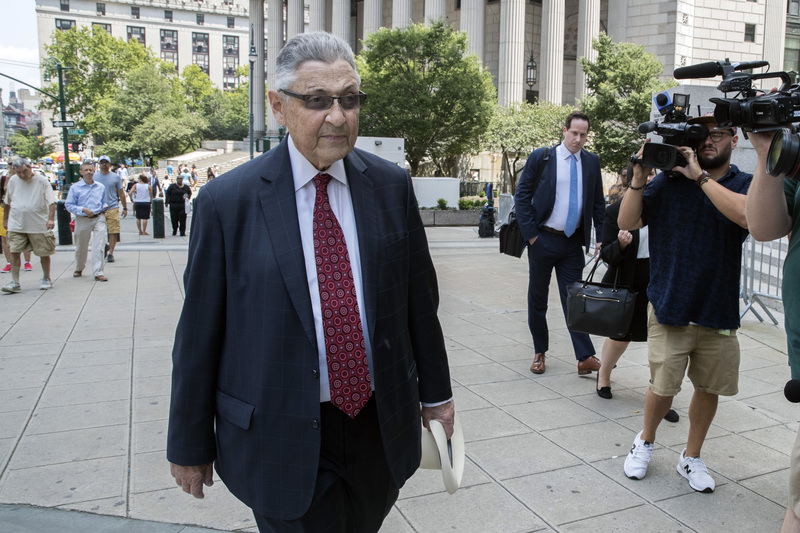 MANHATTAN (CN) – Moved by the 74-year-old’s fears of dying behind bars, a federal judge slammed former New York Assembly Speaker Sheldon Silver as “deeply corrupt” before dealing him a 7-year prison sentence – five years fewer than his original punishment. “I personally believe that Silver knows in his heart of hearts that what he did was both venal and criminal, and that is why he is going to spend much of what is left of his golden years in jail,” U.S. District Judge Valerie Caproni said over the court of a roughly hour-long sentencing hearing. Silver’s advancing age and family support earned him some mercy from Caproni, who previously sentenced him to 12 years imprisonment in 2016 following his first conviction. Yet the twice-disgraced Democrat’s refusal to give up his three-year fight earned him a fiery monologue by a federal judge railing against seemingly intractable Empire State corruption. “While I appreciate that Mr. Silver feels bad and I fully respect his constitutional right to persist in his position that he did not commit a crime, his inability to publicly admit that which 24 New Yorkers have now found proven beyond a reasonable doubt may suggest that Mr. Silver has not entirely come to terms with the fact that he is exactly what too many people think all politicians are, and that is deeply corrupt,” the judge added. Silver has been on the receiving end of Caproni’s righteous indignation earlier. In January 2015, federal prosecutors torpedoed Silver’s political career by accusing him of accepting $3 million in bribes through two law firms. The charges would become the opening shot of an anti-corruption crackdown that would jolt both branches of the New York Legislature – and ultimately, insiders at the governor’s office. “All were convicted, meaning corruption cases have touched, directly or indirectly, all three of the infamous men in the room,” Caproni noted, adding that those same men shut down the Moreland Commission, an investigative body established to probe pay-for-play in New York. Convicted twice, Silver escaped his initial sentence in the wake of a U.S. Supreme Court precedent weakening federal anti-bribery statutes. That case, McDonnell v. Virginia, effectively legalized paying for political access, but a second jury has now found that Silver provided more than handshakes to his benefactors. Stone-faced and slumped, Silver echoed that sense of contrition in court. Silver’s more than two-decade reign over the New York Legislature came crashing down amid revelations that the politician made his millions sending mesothelioma patients referred to him by Columbia University physician Robert Taub to the law firm Weitz & Luxenberg, which specializes in asbestos cases. The disbarred attorney also made $800,000 via two real estate schemes. Before his prosecution, Silver’s district in downtown Manhattan made him a prominent figure after the nation’s worst terrorist attack and one of its most dangerous natural disasters. His spectacular fall, Caproni said, cast a more brutal judgment on his service. “I think he knows that when the time comes for his obituary, The New York Times and the Albany Times Union obituaries will lead not with what he did for the Lower East Side after 9/11 and after Superstorm Sandy and all the wonderful things that he may have achieved as speaker of the assembly, but it will lead with this shameful end to his public career,” she said. Silver’s other contemporary leader in the Legislature, Republican ex-Senate Majority Leader Dean Skelos, will also face an imminent reckoning. Jurors also found Skelos and his son guilty last week on all counts at their retrial. Governor Andrew Cuomo’s former deputy Andrew Percoco and ex-ally Alain Kaloyeros have also been convicted with six other politically connected developers and executives. Silver must report to prison by Oct. 5, after the Jewish holiday of Sukkot.